Have you ever opened up the settings on one of your vSphere Clusters, only to find HA wasn’t configured to your standards? Did someone do some work during the day and forget to put the settings right after their change? After encountering this scenario far too many times, I decided to automate the problem away using vCenter Orchestrator. I created a workflow that runs every night to ensure all settings are correct. Calculate the correct HA percentages based on the amount of hosts in the cluster (I’ll discuss this more later). Set DRS to Fully Automated. The choice really comes down to three policies for enforcing admission control when it is enabled. I won’t go into a deep discussion on each one now, but if you select Host failures the cluster tolerates, and say you select 1 host, which is fairly common, then the HA calculations are completely based off the slot size. The problem here is that if you have very large VMs, then the slot size gets skewed. It is possible to manually override the slot size that vCenter calculates, but then this means you are constantly having to maintain and update that new setting. I decided to calculate my HA Admission control percentage for CPU and Memory based on the resources of a single host failing. I decided to round the value to the nearest whole number. It could be argued that if you have 3 hosts, and you use this formula you will end up with 33% (not 34%) of resources reserved. Either way I don’t think the 1% is going to be a huge problem in an HA event. Now we know what we are going to do, how do we automate it in Orchestrator? 1. Create the workflow to configure these settings on a specific cluster. Make sure to add the general attributes for drsBehaviour, haHostMonitoring, and HApercent. You can do this now, or you can create them when you create the inputs for each custom script. vCO gives you the option to create a new general attribute with exactly the same name when you do this. This is my personal preferred way to do this, as it ensures your naming is consistent throughout your sub workflows. 2. Create the first scriptable task to calculate your HA % value. Basically all this script does is take the cluster, find out how many hosts there are, then use this number to calculate the percentage of host resources to reserve when configuring admission control. If you do not specify the true option, then it will not leave other settings you may have intact. 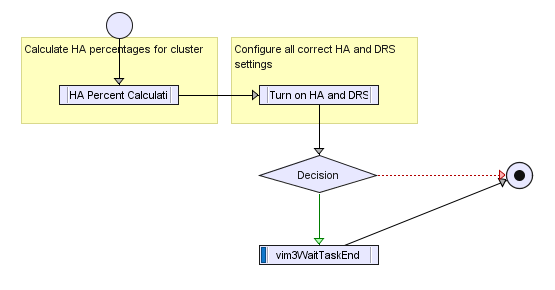 An example might be a specific VM DRS rule you had configured. Essentially, without true, it wipes all settings to defaults and then changes only the settings specified above. 4. Now run this workflow against a cluster and check you get the desired result! Change a few settings, and run it again. Hopefully you should see everything configured to your liking again. How do I get this to run against my entire environment? Simple! Create another workflow which has all your clusters stored as general attributes. Then have this new workflow pass through all your clusters, calling the workflow you created above. Schedule this in vCO to run every night and you can know comfortably that all your settings are as they should be. If someone adds a new host to a cluster, there is no need to check the HA settings, they will be corrected that night. If you need to say keep a cluster in partially automated mode for a while, then simply remove that cluster’s object from the general attribute. When you are ready to add it back, just click it back in. This is just one way to keep your environment in check. My next post will be around VCAP topics, and then I will be writing another workflow on creating a Self Service Snapshot portal. Finally, if anyone wants the actual workflow files for the above workflows, I am more than happy to get them uploaded for you. This entry was posted in Automation by nickcolyer. Bookmark the permalink. How are you? Many thanks for your blog and your help. Can you send me the workflow files?